Well I'm back in Birmingham for the last time. I can't believe after 4 years of university it's almost over. I can't believe how much has changed over that time, how much I have changed as a person. But I'm ready to move on. I'm ready to move out of a student house and I'm ready to be done with the endless workload of essays and exams and reading. I'm ready for the next chapter of my life. It's kinda sad really; I've loved my university experience but the last year really hasn't been great. I've not really enjoyed my final year so much, but I think that is so be expected. Anyway, I just have three more weeks of university left. Which is kinda crazy. I've pretty much finished the last essays of my degree (they need a little more work before the deadlines next week!) and then I just have one exam. I can't believe it's almost over! This was the third outfit I styled as the Republic Blogger of the Month. I was initially completely sold on this dress but I actually really love it. With the gross weather though, I felt a bit stuck on how to wear such a summery dress! 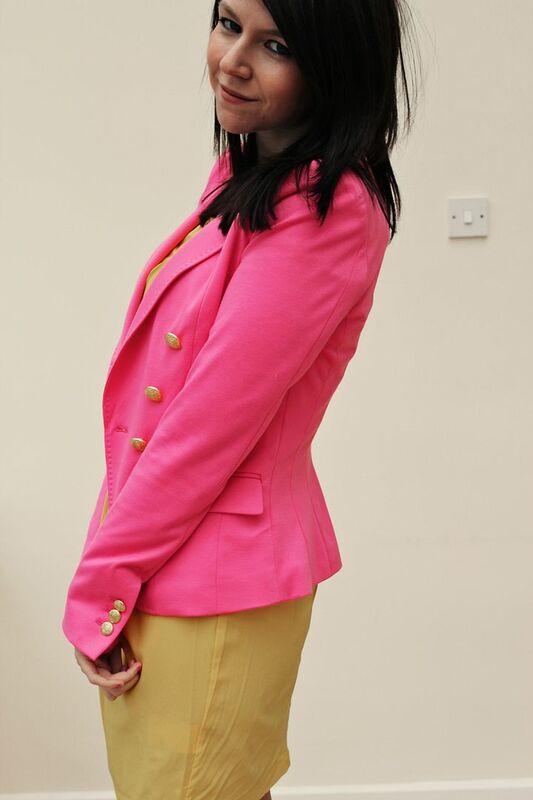 My Mum bought me this pink blazer a few weeks ago though, and I loved the look of it with the yellow dress. Who knew Mr Blobby could be such a style icon? However, on Thursday when I wore this it absolutely chucked it down. I wore this dress for about 3 hour and then wrapped up in jeans and a jumper to go out for lunch with my friends! You can read my post about this outfit over at the Republic blog. Anyway, I'm having a night in with my friend Eve tonight and tomorrow I'm hanging out with my friend Michelle who I've mentioned is over in the UK from her study abroad in Paris, and then Grant and I are going bowling and watching one of my favourite films, (500) Days of Summer. Have a lovely evening guys! I really like your hair dark! One of my favorite outfits from you in awhile, Charlotte! So fresh :) also, I had no idea who Mr. Blobby was, so I googled him. So funny looking! I love this outfit, it's so bright and sunny! 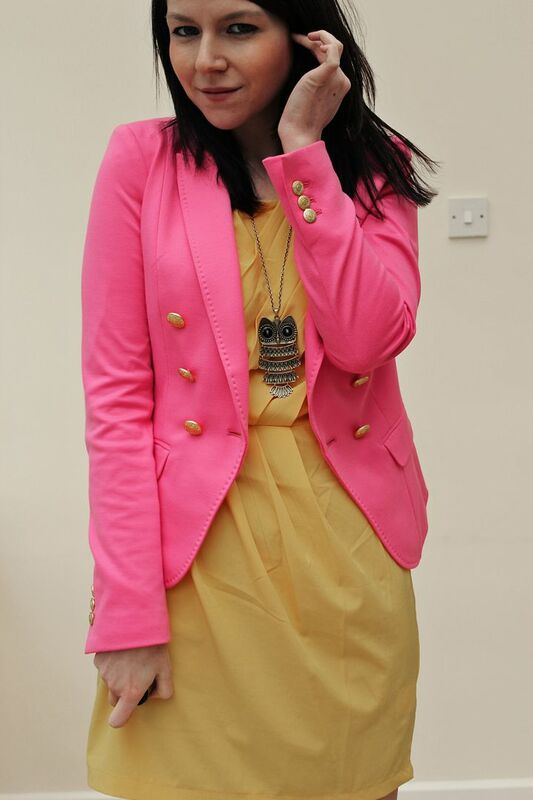 Gorgeous outfit I love pink blazer on yellow dress.. This outfit is amazing, I love the the colour combination!! This dress is really awesome, and so are those shoes!! It is weird when University is almost done for reals, so crazy! Leaving university felt very strange. I loved being a student, but I was ready to graduate. It took some getting used to though, especially when September rolled round and I wasn't heading back to uni. That part felt weird. 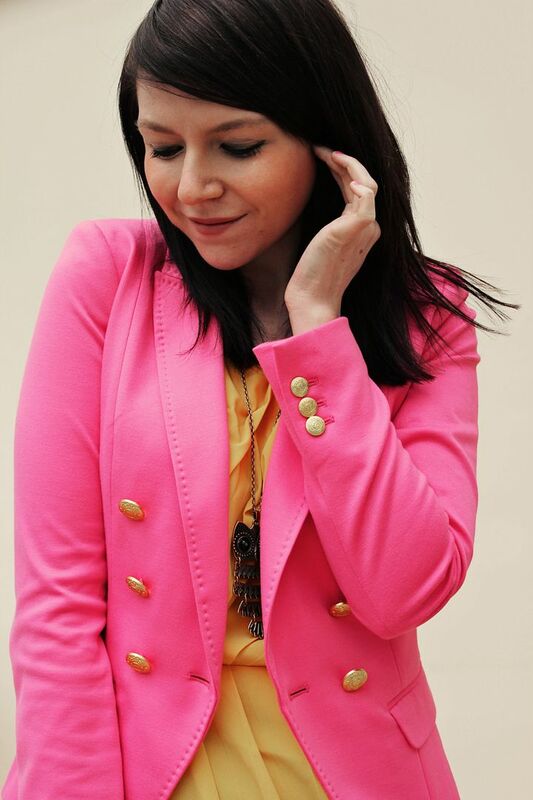 I really love this blazer. It's so bright and happy! Also, I'm really loving the mix of pink and yellow in this outfit. You look amazing! Those mary jane heels are adorable too.